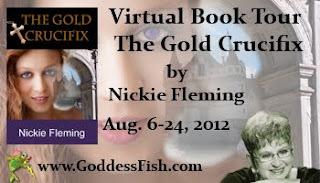 I'm very happy to have Nickie Fleming on my blog today. 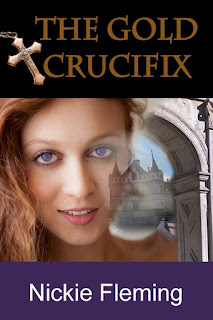 She's currently on a blog tour for her new book, The Gold Crucifix. LStW: What made you decide to start writing romance novels? Nickie: I’ve always been a romantic at heart, dreaming about the knight on his white horse. In my dreams, he came when needed and so I began to write stories which have a happy ending. My novels are not purely romance novels, as they are set into centuries past and also contain elements of action, adventure and mystery. 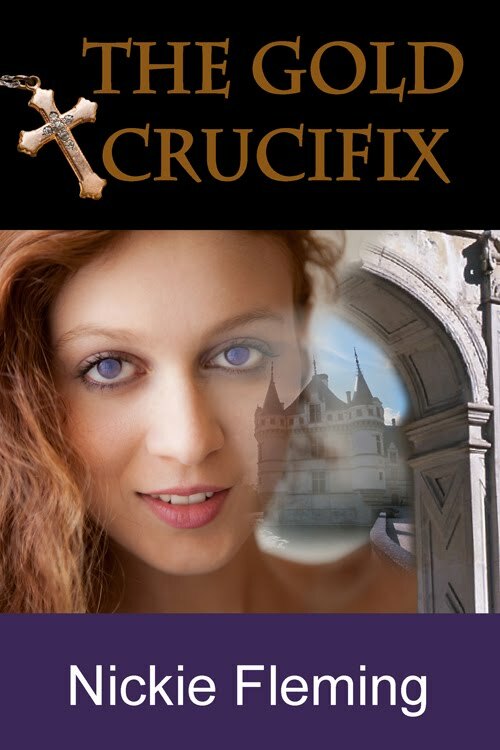 LStW: You've written books about different historical periods: The Gold Crucifix is set during the Restoration and you've also written about 16th century Spain and 18th century France. Do you have a favorite period in history? Nickie: I suppose I have a slight preference for the 17th century, be it in England or France. I can say though that I mainly focus on Europe, although my characters sometimes visit other continents. Writing about Europe is familiar, as we learned about European history at school, and I also looked up many facts for myself as a child already. I still have my filing system of little cards, each with a tidbit of history on it. I sometimes wish I could have lived in 17th century England or France, and have been witness to all the events happening then. I would also liked to have met King Charles II or King Louis XIV. LStW: Any favorite authors and books? Nickie: Difficult question, as I have many favourite authors and books. My Kindle is full of them. Some of my favourite authors include Teresa Medeiros, Karen Hawkins and Sabrina Jeffries, but also Harlan Coben, Janet Evanovich or Jeffery Deaver. Books I love would include ‘Mara, daughter of the Nile’ by Eloise McGraw or ‘Angélique’ by the Golons. LStW: What's next for Nickie Fleming? Nickie: Right now I’m working to finish a novel set in Victorian England. It’s a bit darker and more gothic than my previous novels, but I was in the mood for a change. It’s a spin-off from a short story I wrote some years ago, ‘The black coach’ in Face in the Mirror and Other Stories, also published by Rogue Phoenix Press. Nickie Fleming was born and raised in the historical town of Dendermonde, Belgium – home of the legendary Horse Bayard. She read English Literature at the University of Ghent, and got her master’s degree in philology. Since then, she has been working as a high school teacher. Her interests besides reading and writing are travelling, skiing in winter and enjoying fine food. You can read more about Nickie and her books at her website. She's also on Facebook. England, mid seventeenth century. When young Sarah finds out that innkeeper Amos Jennings is not her father, she feels uncertain and scared. Her problems grow bigger when she starts a job as housekeeper and gets involved with two men who both want her love: the earl of Linfield, and his younger brother Richard. To escape these problems, Sarah takes off to London to begin a new life as actress at His Majesty’s Theatre. Richard cannot forget the young woman her met at his brother’s. He is determined to find Sarah and make her his own -- even his wife, despite what his family thinks of it. But love never comes easy. Richard and Sarah will have to face many a storm--even the Great Fire of London--before they can become one. It happened in the last bend of the lane, just before the clearing where the lawns and flower-beds of the manor became visible. All at once Sarah heard the thundering of a horse in full gallop, and before she could even jump to safety, she was pushed off the road into the soft grass of the verge. She was so stunned she did not hear the curse of the horseman and how he pulled his mount to a standstill. Slowly, she crawled to an upright position and immediately noticed the pain in her right knee. Neglecting the fact that her basket had fallen and its contents were shattered over the path--some of them trodden on--she started to rub her knee fiercely. Only then did she notice the man, who had turned his horse and who was now throwing disdainful looks in her direction. Suddenly, she realized what danger she had barely escaped. This notion triggered a fit of anger, which became so violent she turned hot and enflamed. Returning his glances with eyes that shot fire, she snarled, "You fool! You could have hurt me!" The look in his eyes remained cold, but the tone of his voice revealed a show of interest. "In case you shouldn't know, let me warn you that you find yourself on private property," he said. She refused to be intimidated and was quick to answer. "So right you are. But I am the housekeeper of the Grange…sir," and she put all her contempt into the word, "and I have every right to be here. I was walking alongside the road and you should have been more careful! The least you can do is offer your apologies to me, and if you're a gentleman, you will help me pick up my belongings." The author will award two (2) personally autographed print copies of her novel, The Haversham Legacy, to randomly drawn commenters during the tour (INT). Thank you for hosting Nickie today. Thank you for dropping by! I'm glad you enjoyed the excerpt!